Figure 7-3. - Comfort zone chart. saturated (maximum water vapor at that temperature) and the temperature of that air falls, a point is finally reached at which the air is saturated for the new and lower temperature, and condensation of the moisture begins. This is the dew-point temperature of the air for the quantity of water vapor present. 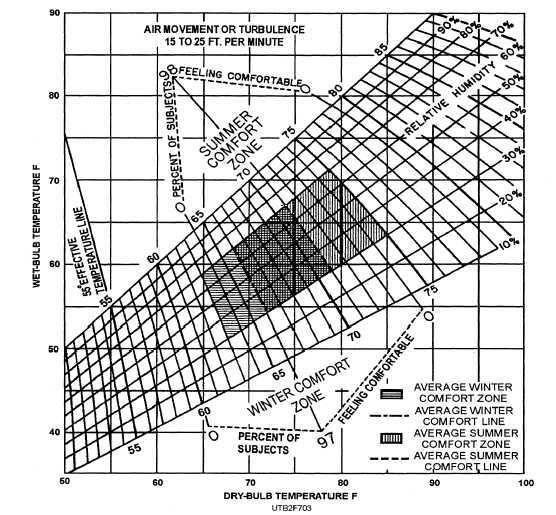 When the air is not saturated but contains some moisture, the dew-point temperature is lower than the dry-bulb temperature, and the wet-bulb temperature is in between. As the amount of moisture in the air increases, the amount of evaporation (and, therefore, cooling) decreases. The difference between the temperatures becomes less. When the air becomes saturated, all three temperatures are the same and the relative humidity is 100 percent. To HUMIDIFY air is to increase its water vapor content. To DEHUMIDIFY air is to decrease its water vapor content. The device used to add moisture to the air is a humidifier, and the device used to remove the moisture from the air is a dehumidifier. The control device, sensitive to various degrees of humidity, is called a HUMIDISTAT.